If you would’ve told me a month ago that the Buccaneers would beat the Chiefs and Seahawks back-to-back, I would’ve said you’re crazy. If you would’ve told me a month ago that the Bucs would score just 14 points against Seattle – at home – and still win the game – I would’ve said you’re crazy. Well, there is nothing crazy about the way Tampa Bay is playing right now. The Bucs beat a very good Seahawks team at Ray-Jay on Sunday, 14-5. Yes, it’s one of those oddball-looking scores but you won’t find me or any other Bucs’ fans complaining about it. This one was all about the defense, which was getting shredded week after week during the first half of the season. But in the last three games, we’ve seen a complete turnaround. On Sunday, they sacked Russell Wilson six times, picked him off twice, and kept the Seattle offense out of the end zone. One of those interceptions was by Alterraun Verner, who was on the field just two days after his father passed away. If you haven’t seen his reaction yet, you’ll have a tough time not crying. It was a scene very reminiscent of Kwon Alexander’s performance in Atlanta one year ago. As for the offense, Mike Evans caught two more touchdown passes from Jameis Winston, both in the first quarter. The offense didn’t do much the rest of the way, but the strong performance of the defense bailed them out. So where do things stand with five games to go? The Bucs are 6-5, still one game behind Atlanta in the NFC South. They are a half-game behind Washington for the #6 seed in the conference. Their remaining games are against the Saints (twice), the Panthers, the Chargers and Cowboys. Yeah, I had to sneak that Dallas reference in at the end. It won’t be easy, but the Bucs are peaking right now; they just have to keep it going. That season went by way too quickly. It’s hard to believe it’s already over. The Tampa Bay Bucs finished with a record of 6-10. That’s an improvement over their 2-14 record of 2014, but they still finished in last place in the NFC South. I thought I’d take a look back at the best – and worst – of the Bucs’ 2015 season. Please note: these are listed in no particular order. Jameis Winston. Remember what happened on his first pass of the season? I do. It was intercepted and run back for a touchdown. Sure, there were many moments where the No. 1 overall pick looked like a rookie. But there were many more where he looked like the Bucs may have found their franchise quarterback. Winston threw for over 4,000 yards (4,042 to be exact.) That’s the third-most passing yards of any rookie QB in NFL history. He threw 22 touchdowns vs. 15 interceptions. He also ran for six touchdowns. You can make a very compelling case for him being named rookie of the year. Perhaps most of all, he looks and acts like a leader. He needs to work on the deep ball, but that can be done. Doug Martin. This was the last year of his contract in Tampa. I am with a lot of Bucs’ fans in begging the team to re-sign him. Martin had his best year since his rookie season: he rushed for 1,402 yards and six touchdowns. The TD number is a bit low, but he had a number of long, long runs that put his team in excellent scoring position. His best game was Week 11 against Philadelphia – when he ran wild for 235 yards. Dirk Koetter. Why does the offensive coordinator make this list? It’s simple: the Bucs didn’t have one last year; remember when Jeff Tedford left before the season began? Koetter came in, and made an instant impact. The Bucs finished with the fifth-best offense in the NFL in terms of total yards. They averaged just over 21 points per game, which ranks 20th in the league, but still a big improvement over last year. But when I look back at the season, this wasn’t the same old dink-and-dunk Tampa Bay offense that I’ve seen since…well, forever. The defense. As I’ve said repeatedly over the past four months, Lovie Smith was calling the plays on the defensive side of the ball. That’s why he deserves much of the blame for a unit that allowed just over 26 points per game, sixth-most in the league. The secondary was just awful. Take your pick: Johnthan Banks, Mike Jenkins, Sterling Moore, Alterraun Verner – it didn’t matter who was trying to cover the opposing team’s receivers. Here is the most alarming stat I could find: the Bucs allowed their opponents to complete 70% of their passes. That is insane. Whether it’s the players, the scheme or the coaching – this should be the first order of the business in the offseason. Mike Evans. On one hand, he had another 1,000 yard season – gaining 1,206 yards. On the other hand, he only scored three touchdowns. And then there were the drops – all of them. According to sportingcharts.com, Evans led the league with eleven dropped passes. And he heard some boos from the fans at Ray-Jay periodically. BEST GAME: week 11, when they walloped the Eagles, 45-17, and racked up 521 yards of total offense. WORST GAME: week 7, when they lost to the Redskins, 31-30, a game in which Tampa Bay blew a 24-0 lead. I know Washington ended up winning the NFC East, but blowing a lead like that against anyone is unacceptable. As always, it’s been a lot of fun writing about the Bucs this season. And I am most grateful to my readers. This is neither goodbye nor farewell, of course. It’s just me saying thank you. Tampa Bay fans: there is reason for hope. There was a lot to be excited about in Monday night’s preseason victory over the Bengals at Ray-Jay. Jameis Winston looked great. Doug Martin looked like the Doug Martin of his rookie season. Heck, even the defense sacked Cincinnati QB’s a few times. I know, I know: it’s only preseason. But how could you not like what you saw in the first half of that game? I will only talk about the first half, because all of the stars were out of the game in the second. Let’s start with Winston. Man, he has cannon for an arm. He marched his team right down the field to start the game, capping it with a scramble to the right pylon to open the scoring. Jameis finished 8-of-13 for 90 yards before limping off the field in the second quarter. It doesn’t appear to be a serious injury, and the Bucs did the right thing taking him out of the game at that moment. Speaking of injuries, hopefully the one suffered by Mike Evans isn’t critical, either. Martin also looked great while he was in there: six carries for 59 yards, including an impressive 30-yarder on the opening drive. We haven’t seen this from him the past two seasons. Hopefully this is a return to his rookie form, when he rushed for over 1400 yards. The defense sacked Andy Dalton three times. Let me repeat that: the defense recorded three sacks. We haven’t said that much over the past few years. Gerald McCoy looked like the leader he’s believed to be. Altrerraun Verner had a Pick 6, courtesy of A.J. Green having butterfingers. There was one problem area that still needs to be addressed immediately: the penalties. The Bucs had 14 of them for 153 yards, most of them coming in the first half while the starters were still in there. Penalties were a huge problem last year, and on Monday night, it seemed like there was a yellow flag on the field on almost every other play. Still, a win is a win, even in the preseason. And Monday night’s performance gave Buccaneer fans reason to at least hope that things could be different in 2015. Now that the Buccaneers have reached the midway point of the 2014 season, it’s time for a midterm report card. As you might expect, there are more bad grades than good ones on a team that’s 1-7. I’m not going to grade each and every player, because that would take forever. When the Bucs hired Smith almost immediately after firing Greg Schiano, there was a sense of hope among Tampa Bay fans, a sense that things would start to turn around. There was hope that Smith’s defense would be as fierce as what we saw in the late 90’s and early 2000’s. Licht and Smith brought in a ton of free agents on defense (while letting Darrelle Revis go.) They spent their entire 2014 draft on upgrading the offense. Eight games into the season, the Bucs are second from the bottom in both total offense and defense. Some of the pundits predicted the Bucs could be a sleeper team for the playoffs. I was just hoping for some improvement. It hasn’t happened. We should’ve known something was up when they dropped their first two games at home to backup quarterbacks. Even coming off a 4-12 year, the Bucs have been a major disappointment in my opinion. 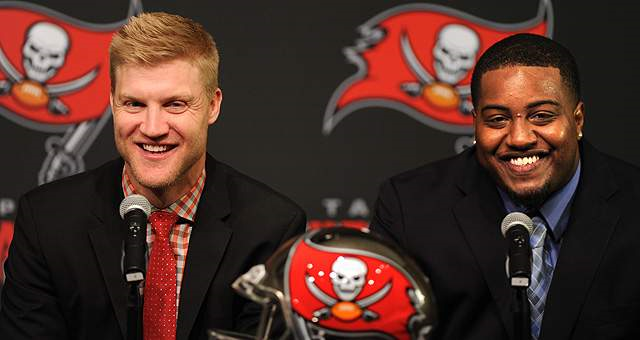 The Bucs started the season with Josh McCown as the starting quarterback. In 2 ½ games, he threw two touchdowns, four interceptions, and put the ball on the turf a number of times. He’s been sidelined with an injured thumb suffered during the Thursday night debacle in Atlanta. Enter Mike Glennon. He’s completed 57% of his passes so far. At times, he’s looked OK. Other times, like Sunday in Cleveland, he looked terrible. Now, he’s in danger of losing his job back to McCown. While the quarterback position is hardly the only problem on this team, it should be priority #1 in next year’s draft. This group has also been a big disappointment. Remember back to just before the season began, when Tampa Bay acquired pro bowl guard Logan Mankins from the Patriots? That hasn’t helped a unit that has struggled in both the running game and pass protection. Left tackle Anthony Collins and center Evan Dietrich-Smith have not played well at all. The line has given up 21 sacks through the first eight games, and that doesn’t count all of the times the quarterback has been running for his life. It’s worth noting that Smith and Licht also overhauled this unit from last year as well. He was the Bucs’ first-round draft pick this year, and we’ve gotten a glimpse of what he can do. While he hasn’t been perfect, he leads the receivers in yards (460) and touchdowns (4) and is tied with Vincent Jackson for the team lead in receptions. He has the potential to be a star down the road, no question about it. Let’s think back to the defensive players Smith brought in: Michael Johnson, Alterraun Verner and Clinton McDonald come to mind. Have any of them made an impact? I don’t think so. I hadn’t heard Verner’s name much at all until Sunday, when he was beaten soundly for the winning touchdown in Cleveland. This is the guy who supposedly has to fill Revis’ shoes in the secondary. As mentioned early, Tampa Bay is 31st in the league in total defense behind only Atlanta. They’ve given up the third most points; only Jacksonville and the Jets are worse. They’re near the bottom of the league in sacks. And turnovers – something Smith prides himself on – have not come as often as the fans would like. Oh, and former first-round pick Mark Barron is now with the Rams. I’m giving McCoy a grade, because he’s one of the leaders of this defense, and recently signed a 7-year, $98 million contract. He has been one of the few bright spots on defense. His five sacks lead the team. And this guy was playing with an injured hand for a few games. You mean there’s a player on a 1-7 team that deserves such a grade? Like McCoy, David is a leader on defense. He leads the team in tackles. This guy is everywhere on the field. I look forward to watching #54 in person when I travel to Ray-Jay this weekend to see the Bucs play the Falcons. Rookie kicker Patrick Murray has been so-so this year. He is 8-of-12 on field goals. He’s had two kicks blocked, one of them coming in the most recent loss to the Browns. The mistakes on special teams on Sunday actually caused me to lower this grade from a C to a D.
What a week it has been for the Tampa Bay Buccaneers. That’s not much of a surprising statement, given that the start of free agency always results in a lot of activity around the league. But I wasn’t expecting it to be quite like this. It all started even before free agency began, when word leaked out that the Bucs were shopping Darrelle Revis. He ended up signing with New England. One year and $16 million later, he’s out of Tampa. That didn’t take long. So who’s new? They picked up cornerback Alterraun Verner from Tennessee, and defensive end Michael Johnson from Cincinnati. Verner had five picks for the Titans last season. And two years ago, Johnson had 11 1/2 sacks for the Bengals. Throw in former Seattle defensive tackle Clinton McDonald, and it’s clear Lovie Smith and Jason Licht are overhauling just about everything on the defensive side of the ball. A few extra sacks this season would be a nice return on this investment. There is also a change on the offensive line. Donald Penn is gone, and Anthony Collins is now a Buc. Like Johnson, Collins spent the past few years in Cincinnati. But the biggest surprise may have come at the quarterback position. Josh McCown signed a two-year, $10 million contract. Signing a QB may not be a shocker. What is surprising, is that Lovie Smith has pretty much named McCown the starter already. So there won’t even be any competition with Mike Glennon? Will the Bucs draft a rookie QB in the draft? Who knows if we’ve heard the last of this quarterback situation.